Shear stress is one of the key factors affecting the large-scale culture of mammalian cells. In this study, numerical simulation based on computational fluid dynamics was used to conduct a flow-field analysis of 7, 50, 200, and 1200 L inverted frusto-conical shaking bioreactors. The results show that the shear rate, specific mass transfer area (a), and volumetric oxygen mass transfer coefficient (kLa) gradually decreased as the scale of the bioreactor increased. Through application of BHK21 and CHO cells in 7, 200, and 1200 L bioreactors, it was found that the cell density and antibody expression level increased as the volume of the bioreactor increased. Moreover, the antibody expression level in a 1200 L bioreactor was nearly 30% and 35% higher than that of 7 and 200 L bioreactors, respectively. 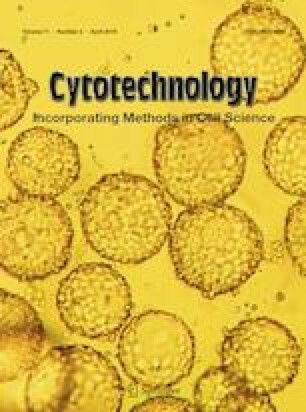 The results demonstrate that the environment with a larger volume is more suitable for the growth and antibody expression of CHO cells, indicating shear stress might be the most critical factor affecting the scale-up of mammalian cells. The online version of this article ( https://doi.org/10.1007/s10616-019-00308-3) contains supplementary material, which is available to authorized users. This study was designed by ND and CL. The experiments were performed by ND, CL and MG. The paper was written by ND and CL. AM participated in manuscript writing and polished the English thoroughly. MG and SZ participated in the data discussion. All authors read and approved the final manuscript. This research was supported by grants from the National High Technology Research and Development Program of China (2012AA021201) and the Fundamental Research Funds for the China Central Universities (Nos. 22221818014 and 22221817014) and the 111 Project (B18022) to Meijin Guo. All supporting data are included within the article and its Additional file. All authors consented to publication of the present manuscript. The authors declare that this is not a study involving human participants and reporting health related outcomes.